Our Crooked Branch: Happy 1/2 Birthday Samantha Jane! Today, Sam turns 6 months old. It's crazy how fast time flies. In some ways I can't imagine a day before she was born, then all I have to do is spend a few minutes alone with her and Addi reminds me that SHE used to get all the attention (see the Pretty girl post, below). She started eating solid foods a few weeks ago but has only had cereal and sweet potatoes. And she hates the cereal. She is a pacifier lover, just like her sister. One of her favorite pastimes is chewing on Mommy's face. I think she's "kissing" me. She is a great sleeper... She sleeps all night in her own bed (most of the time). She LOVES her sister. Addi can make her laugh at any time. She can sit up but can't get there on her own quite yet. Happy 1/2 b-day, Sam! 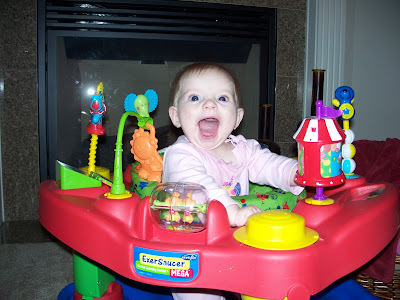 Jack had the same Exersaucer and LOVED it.